Sarah - So, to start off with, when did we first realise that the deep sea was able to support life at all? Alan - Well, the deep sea technically starts around 200 metres and I think it was in the 1800s or the 1700s when a guy called Edward Forbes once said there was absolutely no chance that life could survive in the deep sea. I think when somebody sticks their neck out and says something like that, it kind of prompted a whole wave of people to go out and continually beat that. But it wasn't until the 1950s where they actually pulled up animals that we could confirm were actually alive on the bottom, at depths greater than 10,000 metres. Sarah - And if we're looking at the kind of creatures that live down there, what are the conditions that they have to deal with? Alan - Well first, there's obviously a complete lack of sunlight. Beyond a thousand metres, you can't even detect photons. The food supply is fairly low, just because the majority of food comes from the surface and the farther removed you are from that, the lower the quantity is. Normally, the temperatures are between 1 and 2 degrees, and the pressure of course is something like 1 ton per square centimetre which is extraordinarily high. Sarah - So what sort of species do we see down there? I know that recently, you were involved in the discovery of a giant amphipod, this sort of giant shrimp. It seems like a lot of the species down there are pretty weird and wonderful. Alan - Most taxa are represented in the very deepest parts and the 4 main ones are amphipods, sea cucumbers, worms and bivalves, and things like that. But there's an interesting thing where despite lots of taxa surviving at 10,000 metres plus, quite a lot of them drop out between 8,000 and 8,500 which is interesting and we think that's just a pressure effect. 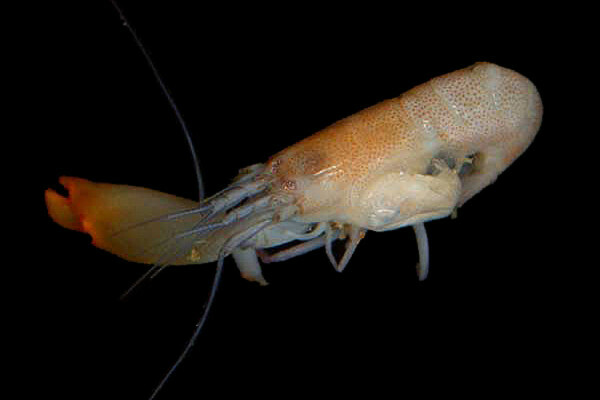 So, the likes of fish and decapods, and things like that, they only survive to about 8-8,500. Sarah - Is it questions like that, like why do we see this drop off at that point that you're hoping to answer with HADES? What are the big questions you're hoping to answer? Alan - Well, the thing with the HADES project, is when you're looking at the very, very deep parts, the Hadal zone is not a continuation of the slopes down to the abyssal plane because the Hadal zone is made up of trenches, big subducting trenches, and they're all isolated from one another. So it's similar to mountain ecology at high altitudes. There isn't one big continuous habitat at these extreme depths. There are pockets around the Pacific. So what we're looking at is - we know quite a lot about the abyssal planes, but how does that change once you start to plummet down into the trenches? The justification for doing it is there's lots of information, lots of science been done about depth-related trends, but they're missing out the bottom 45% of the depth range. So, there's a huge chunk of information that we don't know there and our overarching philosophy is that to sustain and conserve the oceans, we need to know everything from the surface to the very deep bed. You can't just study the top and assume that that's fine. So, somebody has to do the deep bed and that's where we come in. Sarah - And what sort of equipment will you be using to go down that far? Alan - Well we have two main sampling devices. One is the Woods Hole Oceanographic Institute's new ROV called Nereus and it's capable of descending to 11,000 metres and it has done a couple of years ago, and we use that to do video transects to look at what's living on the bottom, to take sediment cores and things like that. We'll be using our own systems which are called landers which are like free-fall camera tripods. So they just descend through the water column and crash-land on the bottom and they use bait to attract in the more mobile animals that you wouldn't normally see on the ROV. We have a couple of camera systems that do that and some traps as well, just some very simple baited traps work surprisingly well at those depths. Sarah - So it's going to be a combination of looking at what's down there, live as it were, with cameras, but also, you're going to be bringing samples back up to the surface? Alan - Yes, I think a combination of the two is really important. You have to get the samples for various cellular and physiological studies and things like that, plus from a taxonomic level, but the reason why Hadal biology for example is decades behind any other area in deep sea is because originally, when they did it, it was nothing more a taxonomic exercise. They didn't really look at what these animals were actually doing or what their role was in the ecosystem. So, it's important to do a combination of both. Sarah - And if we're talking about the kind of challenges that life faces down there, the pressure, the darkness, how does that affect our job of designing stuff to actually go down there and look at these things? Alan - Yeah, there's a whole bunch of problems involved in this and that's what's slowed down Hadal biology all these years, the technical challenges, but I don't believe they exist anymore. The problem is mainly two things, the extraordinarily high hydrostatic pressure at depth and coping with that, and the second thing is just the distance from the bottom to the surface because if you imagine you want to take a simple sediment core, if you wanted to do that, off the beach, you just walk out and take a core, but at 10,000 metres, you need to find a ship which has enough wire to lower down, hit the bottom and back up again. That operation itself would probably be the best part of a day, plus most research vessels won't carry that kind of wire and even then, most wires will break under their own weight at that kind of depth. So, this is why we use freefall instruments to try and overcome that. So once the vehicle leaves the ship, we have no more contact with it. It just basically sinks, hits the bottom and at the end of the experiment, we send an acoustic command to it and it drops its weights and then floats back to the surface again. So, it's a very complicated, very expensive business to be in. Sarah - So what exactly are you hoping to find down there? Alan - What we're looking at is to try and challenge this perception that the very, very deep sea is some kind of stagnant, stable environment that's just kind of eking out an existence in the dark and is of no consequence. There's more and more evidence to suggest or even prove that on a deep abyssal plane, even at 4 or 5,000 metres, there is natural variation throughout the year, but no one has really looked on long enough time scales and we know absolutely nothing really about ecosystems in these deep trenches, and where the food ends up and it's very difficult to try and predict what's going to happen because these trench habitats are so unique in terms of topography. And of course, they're subduction zones as well so you have this huge seismic activity going on there as well. So what happens to the ecosystem then with these enormous mudslides cascading down the trench walls and things like that. So it's a very unique habitat. Sarah - And so, it's not a case that we can really compare it to the kind of energy flow that we see up on land. Alan - No. I mean, if you look at the globe, most of the Earth is deep sea, but there's normally big, huge vast abyssal plains, so when all of the food and the productivity in the surface starts to rain down, it'll land on the seafloor more or less uniformly, whether constantly all year-round or in pulses. But when it goes to the trench, the trench doesn't hold it like that because the trench is kind of a V-shape cross section. So theoretically, anything that comes down should get funnelled along the trench axis. So therefore it's a question whether or not depth really matters. It's where on the trench really matters we think. So one of the things we're trying to prove is whether or not you have this thing called the trench resource accumulation depth where there's a greater amount of food on the trench axis than on the walls. Sarah - That's right in the very sort of the point of the V.
Alan - Yes. So basically, all the food coming down will get funnelled towards the bottom whereas on the abyssal plains, they would just lie uniformly. Previous How do Volcanoes affect Ocean Biodiversity?